When Sarah Millerman meets Nathan Ferrari, her vacation in Italy takes unexpected turns as breathtaking as the Amalfi coast drive. Charming, handsome Navy Commander Nathan Ferrari is staying at his Aunt Alessa’s beach house in Sorrento, while he is on annual leave from Naval Base San Diego. As Nathan puts it, “You’re an American on vacation. I am an American on vacation. It makes sense for us to have some fun together.” Sarah intends to keep the relationship light and flirty and uncomplicated, as they enjoy dinners under the stars at the beach house and day trips around the Amalfi coast and an overnight visit to his aunt’s vineyard in Tuscany. Both Sarah and Nathan have been hurt by lost loves in their past. 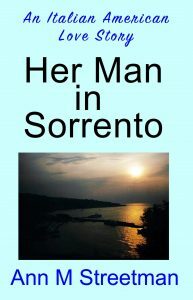 Come along to experience their romance as it develops in scenic southern Italy and San Diego. It’s a sweet Italian American romance with a red, white, and blue twist you don’t want to miss. I have a passion for writing about places I have enjoyed visiting, Italian characters, and people who serve in the military and the people who love them. Her Man in Sorrento allowed me to exercise all those interests in one book. How could I not write Her Man in Sorrento? In real life and in my books, opposites do often attract each other. Nathan is an extrovert Navy commander who takes the time to get to know people wherever he is. Sarah is an introvert focused on finishing her master's degree in cybersecurity and going wherever the job offers take her. They bring out the best in each other. Isn't that the way real love works?